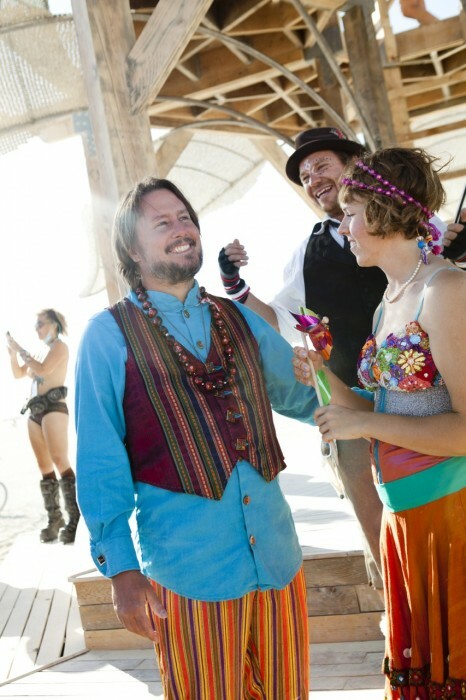 I got married in September 2012 at Burning Man. It was where I met my husband, where we got engaged, and where we feel most free to be whatever we want, particularly ourselves. Jason and I designed his whole outfit together. We wanted it to be an even more colorful version of what he normally wears. This in-between short/pant length is a signature of Jason’s wardrobe. I don’t personally think it’s awkward (it’s capris) and I like making them for him. So it was the obvious choice for this wedding pants. This time I made his pants from a metallic striped cotton that my mom got in Jordan a couple years ago. They have a zipper fly and elastic waist; I’ve developed this pattern just for Jason. 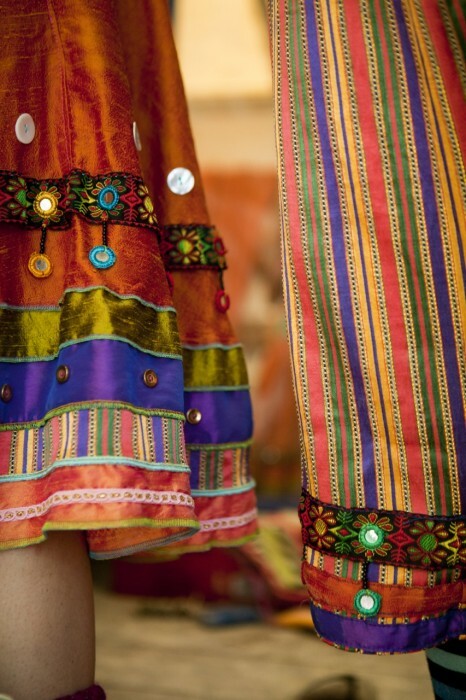 We added bands of fabric at the bottom to correspond to my own skirt. Rainbow socks were also a natural choice! 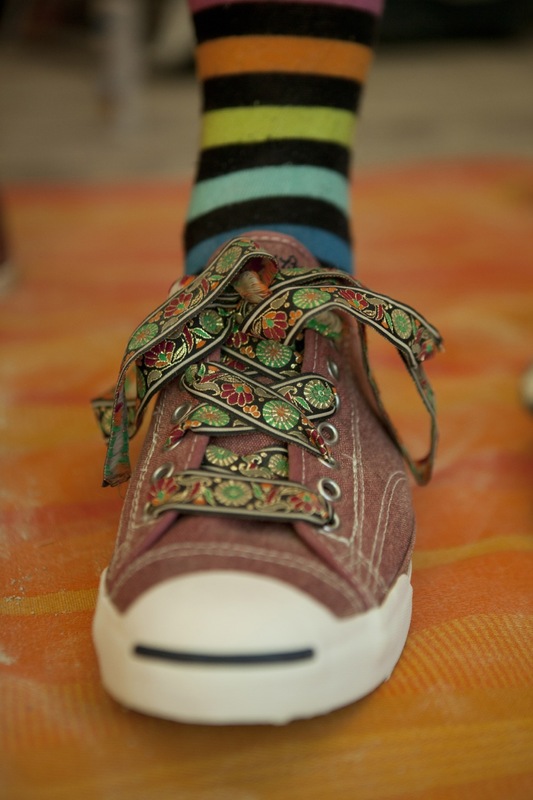 We got the Converse right before we left for Burning Man, and I replaced the white laces with a metallic woven ribbon. His shirt is made from a weighty linen. I washed the fabric three times to soften it up, as well as to get it fully shrunk before cutting. I found a bolt with about 5 yards of this fabric in our storage unit, and I honestly have no idea where it came from or what it was doing there. Luckily it’s the perfect color to bring out Jason’s eyes! We wanted the look of our wedding to be colorful, exciting, and exotic, but we didn’t want to be the white people dressing up in another culture’s aesthetic. Inspired by: yes; appropriating: no. With this in mind, I waffled back and forth on the Nehru collar and tunic length of this shirt. 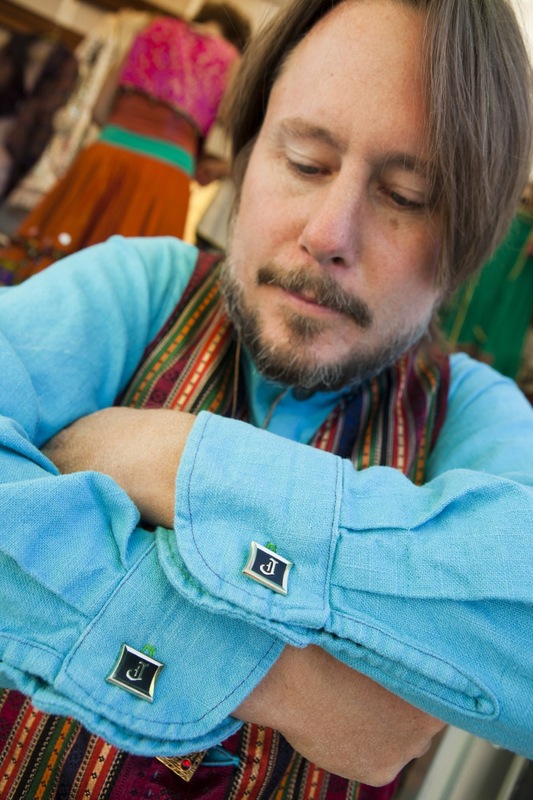 But Jason’s wonderful mind never saw the styling as Indian; in his mind a stand-up collar is spacey. Great design, great rational: we make a good team. 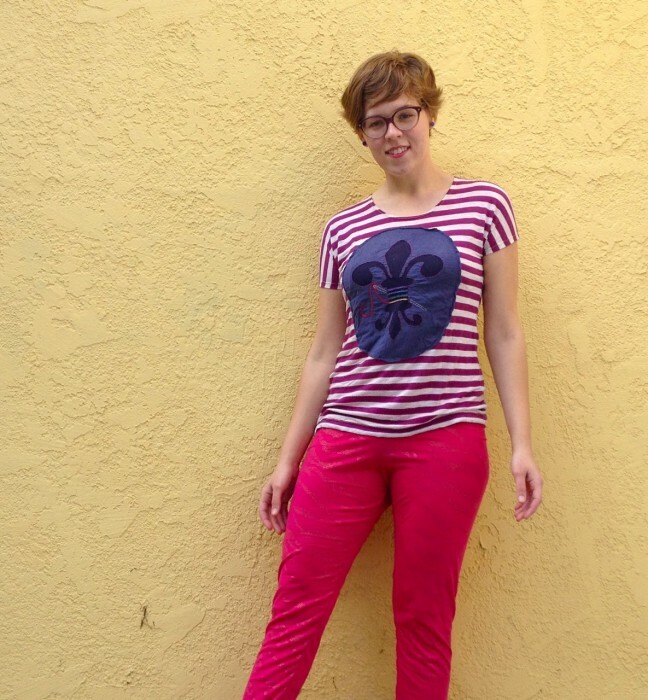 The shirt is a modified version of Simplicity 5366, which I had tested a couple months prior and so I knew exactly what changes needed to be made for the best fit. The fabulous J cufflinks belonged to Jason’s dad Jack, who passed away shortly after we met. Two weeks after our own wedding, Jason’s nephew Jack wore them for his beautiful wedding. 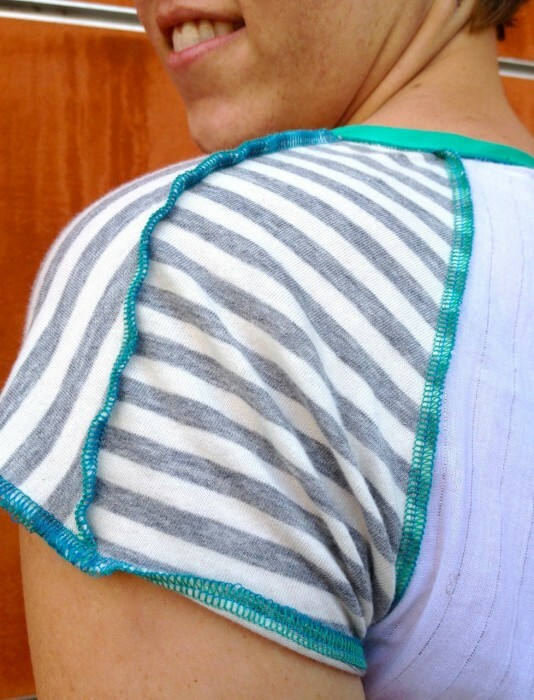 Jason picked out the green and purple for the topstitching. We got these awesome ying-yang buttons during my first visit to the Fashion District in 2009! They are heavy and tactile and yes, honestly, a little bit steampunk. I don’t think anyone noticed, but we rotated them all the way down his shirt, so that the gold was on the left, and then the right, and then back on the left. 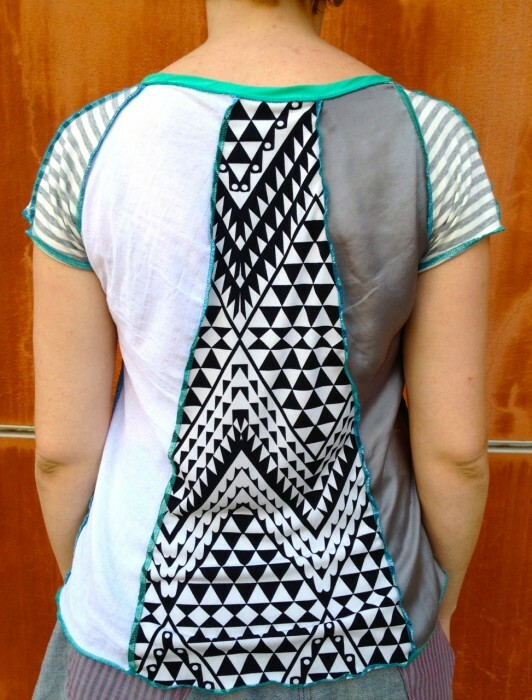 I based the pattern for this vest from one he already owned. 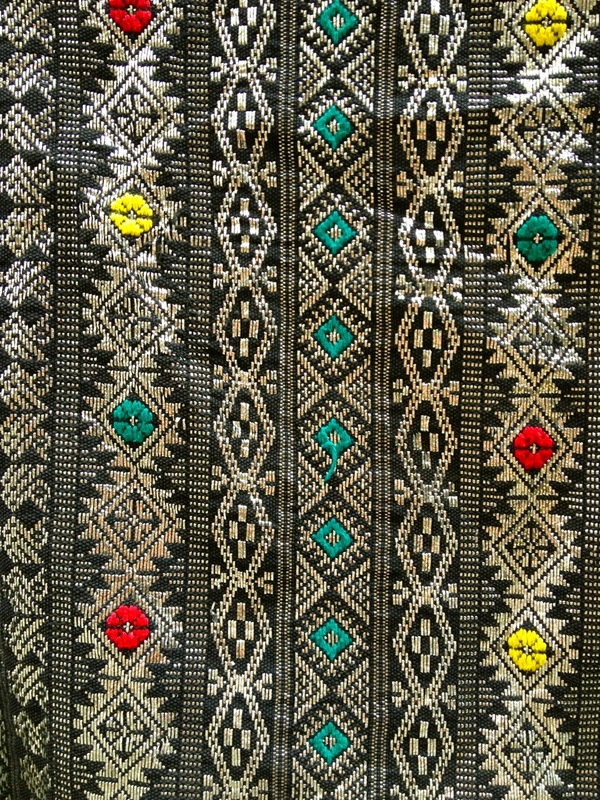 The front stripe is another Jordanian cotton from my mom–there was just enough to cut both sides on the bias so that the pattern was going the way we wanted. 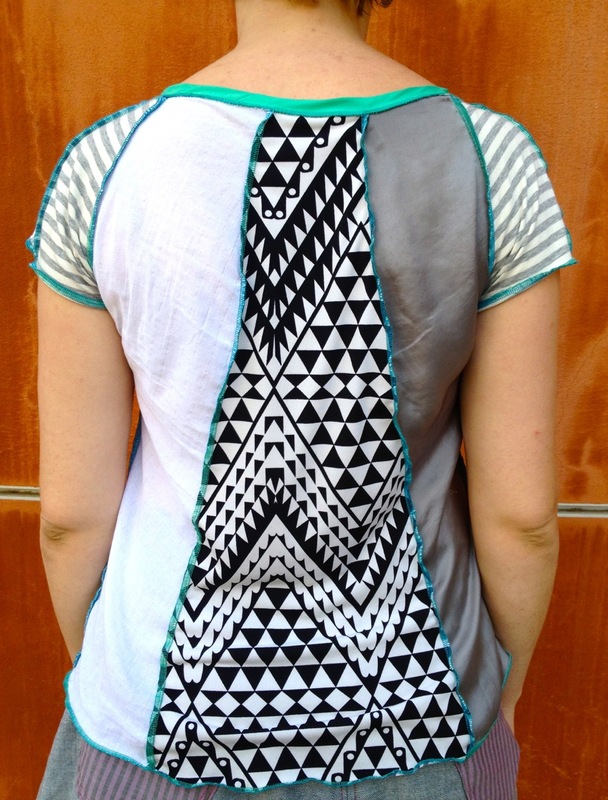 One of my favorite elements from the entire outfit is the back of the vest. 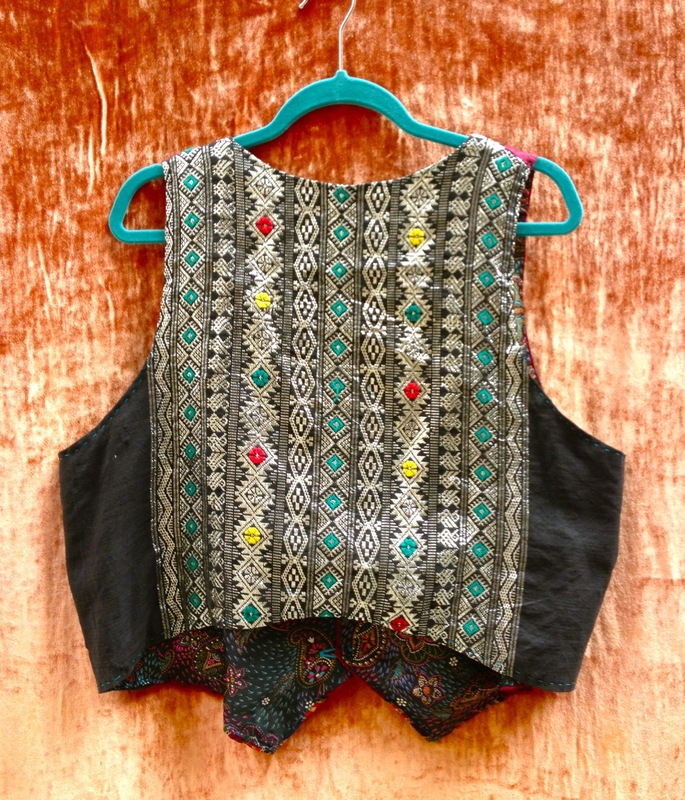 This metallic fabric was hand-made in Guatemala in the 60s, and was given to us by a longtime friend of the Siadek family, Valerie Maxwell (thank you Valerie!). It was exciting to work with, and in pretty great condition. 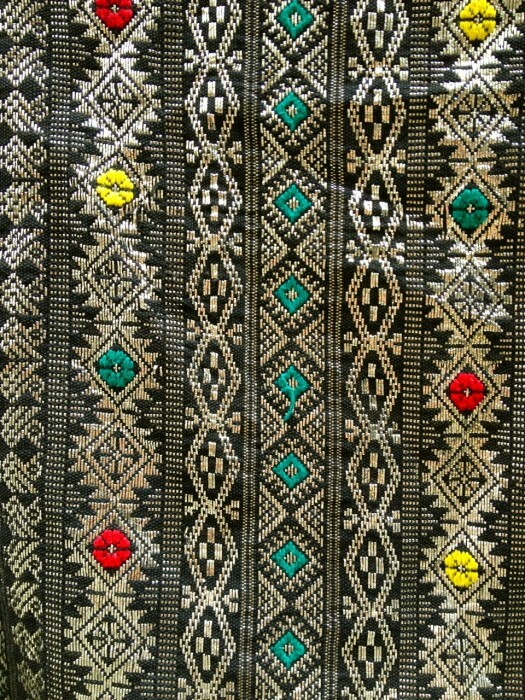 The lining is a vintage poly that was in my cabinet. 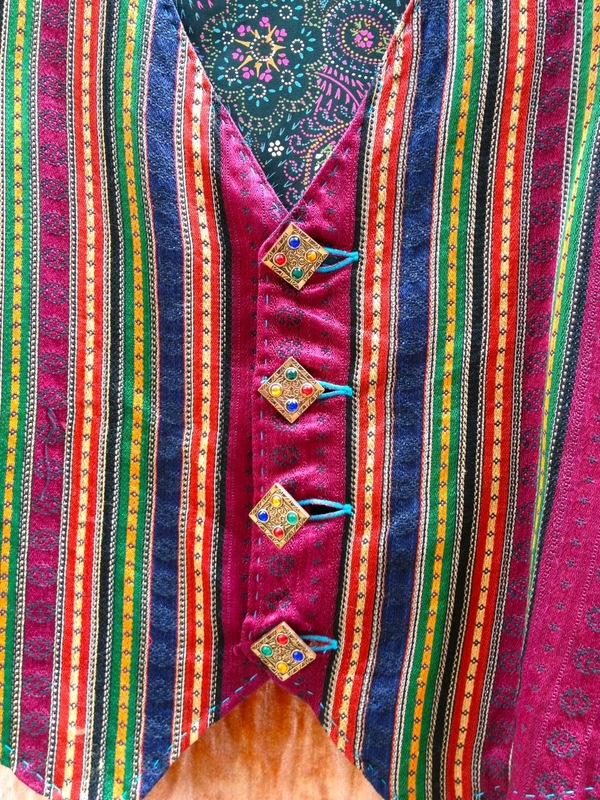 The buttons are aligned so that the top jewels represent chakras (although we aren’t into that, but it seamed as good a reason as any). 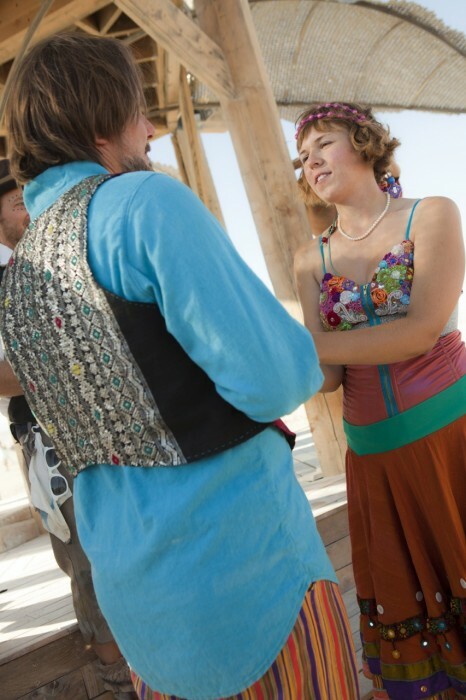 Jason was gifted the koa necklace by our campmate Teale right before the ceremony. I think Jason looked very handsome and very himself! 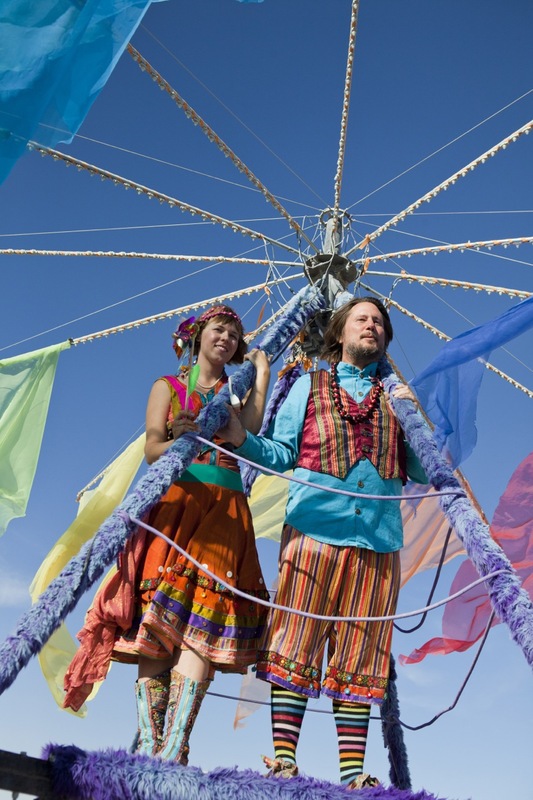 If you’d like to read more and see more photos, we have a whole post about getting married at Burning Man. You can also see pictures of my bridal outfit. Most of these gorgeous pictures were taken by Blake Gardner and Aleck Gandel – many thanks to these talented photographers as well as all the friends who both captured and contributed to our wonderful day! 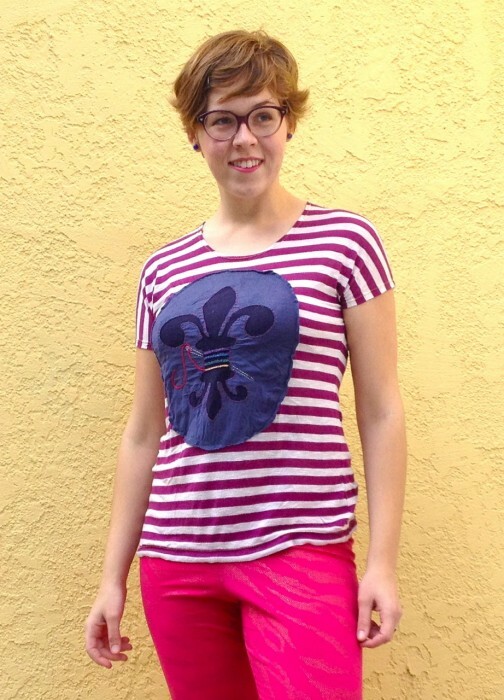 At a recent sewing party I got a copy of Twinkle Sews, and was instantly drawn to the chic and effortless style of the Cool Contrast Tee. The pattern calls for chiffon as the main and lining fabrics, but I knew that this design would be a great stash buster. Since I didn’t buy any fabrics and the book was a gift, this blouse cost me nothing. I’ve always been intrigued by achieving rainbows beyond ROYGBIV, via texture or pattern, particularly in black and white (I have sketchbooks filled with luscious pen and ink drawings). 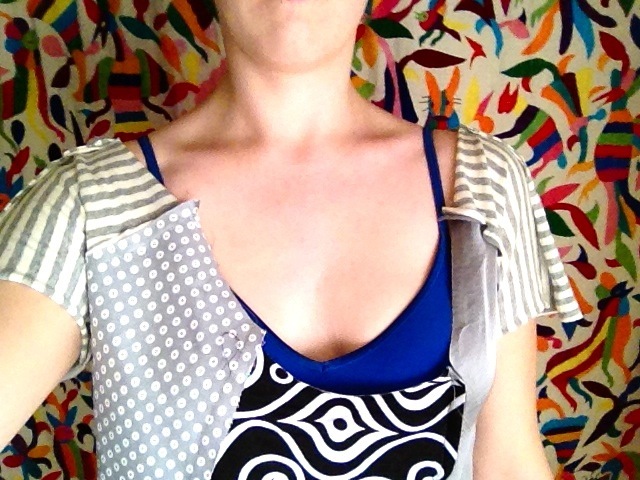 I was very excited to use so many of my colorless scraps in this top. 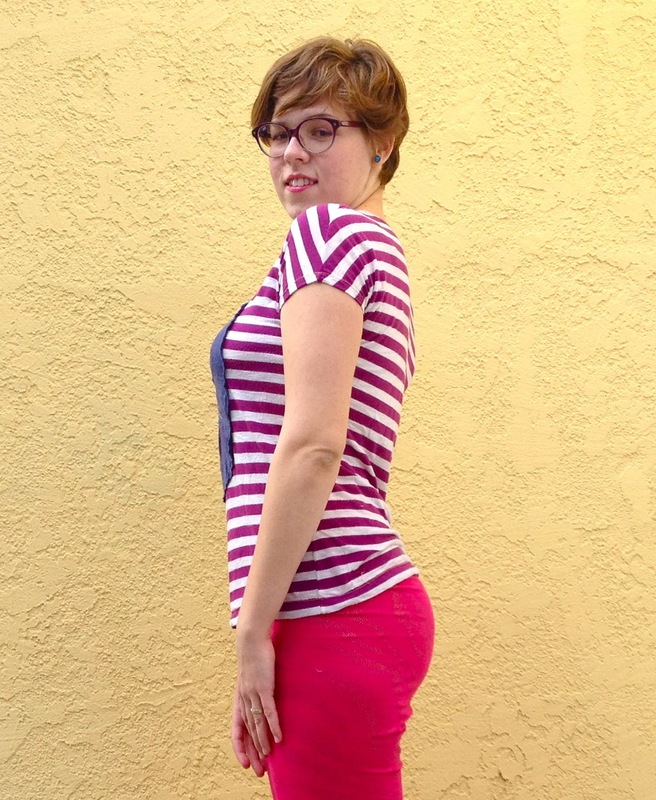 I cut a size 8, which seemed pretty true to my measurements, although of course there were fit adjustments. Since I used so many different fabrics of varying weights, it’s difficult to make any fair judgments on the pattern. It was definitely too low and wide at the top. I took in all the seams about 1/2″ which helped with the gaping at the front and back. 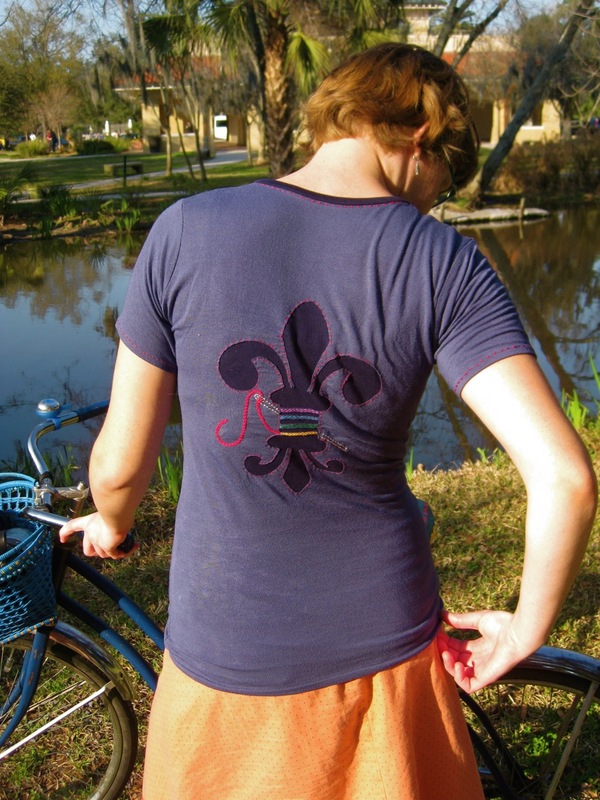 If I were making this again, I would add 1″ to the front pieces; the back is fine. 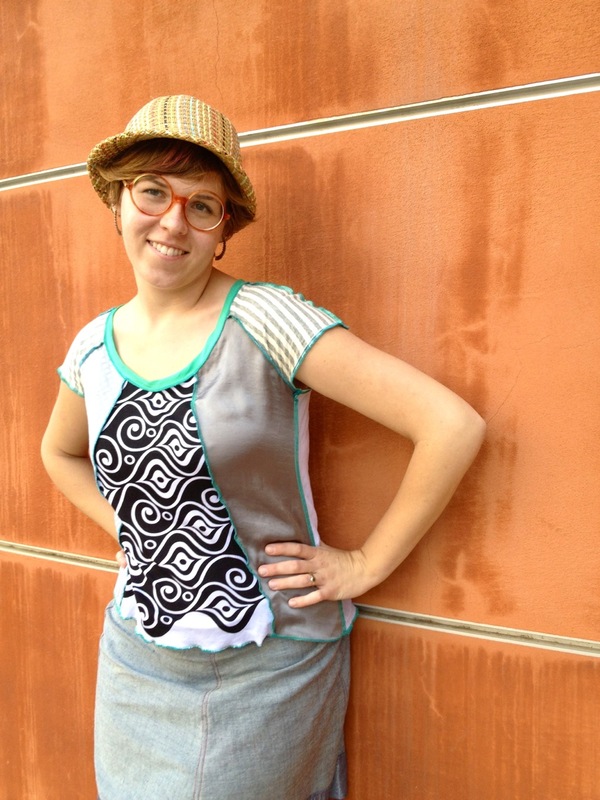 The only version of this top confirmed my suspicions that the hemline is way short, so I lengthened the pieces by 2″ at the bottom. I omitted the band at the bottom. Since I added length to the panels, I didn’t need the band for modesty. But my main reason that I left off the band, and usually do, is because I feel that the bright horizontal stripe across my hips makes me look way wider than I normally do. It’s calling attention to the widest part of my body, and while I’m pretty comfortable with my shape I don’t feel like that’s a flattering look on me. 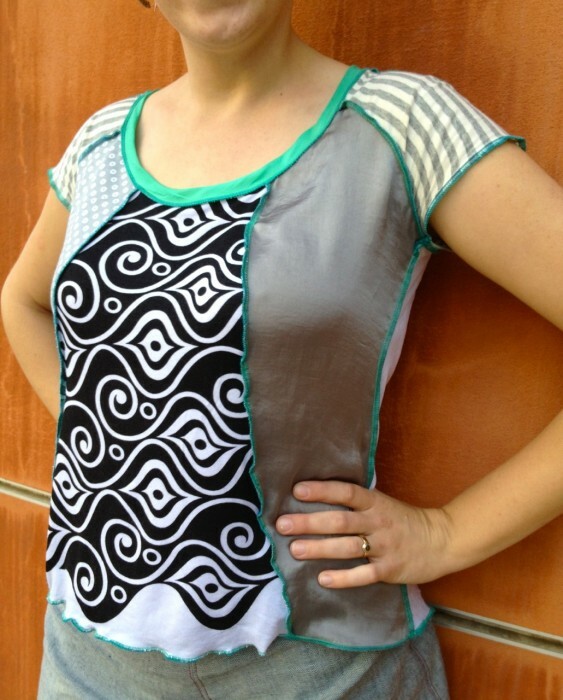 I love the princess seams and raglan sleeves–all those seams make fitting very easy! 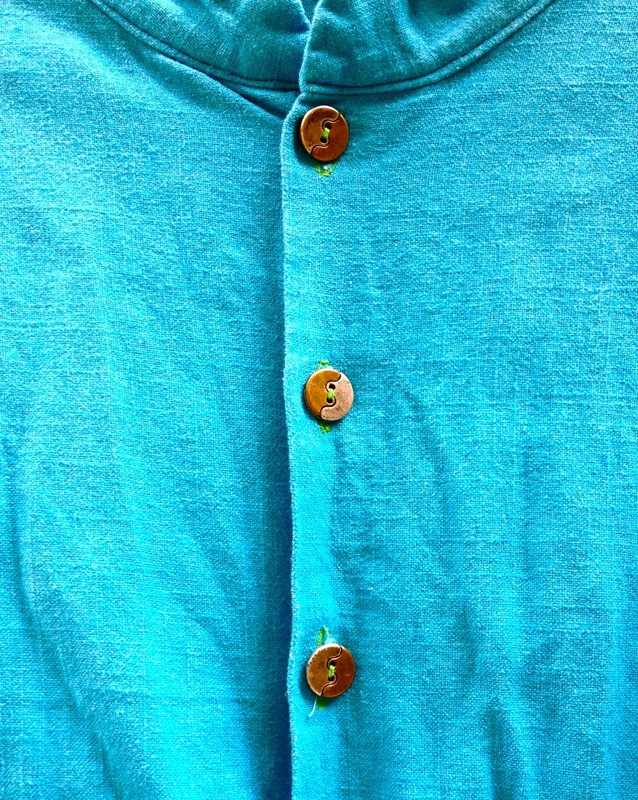 To showcase the style lines, I opted for exposed seams, which I serged with teal threads to tie in the sea-foam bias tape at the neckline. I’m happy with this blouse, although I had a hard time figuring out what to wear with it. Pants might be better than a skirt, but we were spending the day walking around UCLA and Westwood, and I wanted to catch the breeze. I’d like to see the pattern made entirely in knits, as well as the double chiffon suggested by the book.